We are so confident in the health and temperament of our Shorkie puppies that in the event one of our puppies should develop a genetic issue that is outlined in our warranty we will REFUND YOU THE COST OF THE PUPPY up to 5 yrs of age. NO other website or breeders offer this. So please know as your breeder we are with you on this journey all the way! The Shorkie Club Of America Says NO to TEACUP SHORKIES! Ask your vet about TCUP PUPPIES! and the health risks they can have. No Ethical breeder breeds for TCUPS on purpose! First let me say THERE IS NO SUCH THING A teacup shokies!There appears to be quite a bit of BAD INFORMATION ONLINE about the term Teacup Shorkie and Shorkie puppies. There also seems to be no shortage of Shorkie breeders ready to take your hard earned money by selling you a poorly bred Shorkie by using the term TEACUP and or Toy sized puppies..
so buyers beware! DO YOUR RESEARCH! Many people contact me in search of a TEACUP size shorkie and hence it made me realize there needs to be a website that informs people about the Shorkie breed and the size and the standard that has been set forth by the Shorkie Club of America and the puppies it produces. One of the most frequently asked questions that we get is "do you have any teacup Shorkie puppies for sale?" The simple truth is that no breeder anywhere has a "teacup" Shorkie puppy because no such classification exists. Why then you may ask, do so many breeders advertise their puppies as teacup Shorkie puppies for sale? 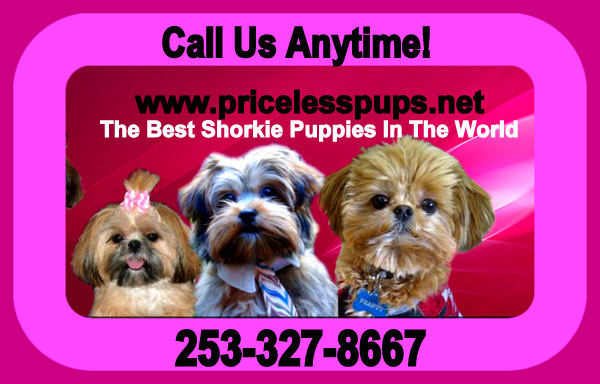 Fraudulent advertising for Teacup Shorkie puppies is the #1 reason. Advertising anything that says TEACUP is a huge money maker for that breeder. Some unscrupulous breeders advertise teacup Shorkie puppies to take advantage of those people who are not very familiar with the Shorkie breed. By telling someone that they are getting a "teacup" Shorkie, they make the potential puppy parent feel that they are getting something special, something that is one of a kind . You will also see these teacup puppies are priced outrageously high and this supports the idea you are paying more for something that is extremely rare when in fact you may be purchasing a genetic nightmare that will cost you thousands of dollars in vet bills and much heart ache over the years. Sadly, there are people out there breeding Shorkie puppies who simply aren't knowledgeable enough about the Shorkie breed and are just throwing any Shih Tzu with any Yorkie and hoping for the best. PLEASE UNDERSTAND THIS FACT!!!! . The smallest dog in the world, according to the Guinness Book of World Records, was a Chihuahua who weighed just under 2 pounds at 1 lb. 14 oz. For someone to claim that they regularly have adult Shorkie dogs weighing less than 2 pounds is a stretch to say the least. Remember a Shorkie has Shih tzu in it. The bone structure alone would be more than 2 lbs. Well bred shorkies do not through back to the yorkie side on a regular basis.!!!! AND THEY HAVE GOOD SOLID BONE STRUCUTRE They are a combination of both the breeds perfectly blended but on a 95%... Range are more shih tzu like in appearance and temperament . On the 5% occasion that a shorkie looks like a yorkie.. the same rule applies. They should never have thin balding coats!!! that is the first sign of a poor quality breeding or a under lying health issue. That applies to all breed of dogs!!!! It could be a sign of RED MANGE!!! beware. Since starting the Shorkie breed almost 20 yrs ago as of 2009....I have never come across or bred any Shorkie puppies with Thin Balding coats and have never experienced Shorkies throwing back to the YORKIE side on a regular basis as a breeder in Alabama professes. ON OCCASION a puppy may be more yorkie like .. but that rarely occurs and is the very reason we use the shih tzus as the mothers. Now again please understand we do get the tiny tiny ones on occasion. BUT WE DO NOT BREED SPECIFICALLY FOR THAT PURPOSEFULLY. THAT ARE CERF(eye tested by dog (etymologist) OFA( knees hearts elbos and hips) AND BILE ACID TESTED to ensure the liver is functioning properly! but still problems can arise!!! Sherry Carter Also makes claims that no one can get their hands on these tinies and they are such a rare breeding when in fact we have references on our site with tinies that are 4 lbs and under that will attest to how they are susceptible to issues! Ask any professional dog trainer and they will let you know.. getting two puppies especially litter mates is not a good idea.